Oh Tannenbaum! My folks are here for Thanksgiving and enjoy going out to cut the tree. I did not realize that Mack was helping me. 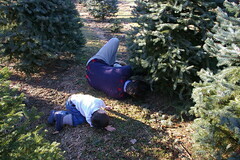 It was a beautiful day and we ended up with a blue spruce. Beautiful tree but prickly!